A portrait of a sheep being held on a leash by a man, selected by the group for sacrifice in the case of a woman possessed by a spirit at Yackwac village. Castrated sheep and goats were frequently used in sacrifice in place of oxen, with particular care taken to note the way the beast fell, since this may indicate the success or potential failure of the sacrifice. Evans-Pritchard described having witnessed a Lou sheep sacrifice at Yakwach for the girl possessed by a lion-spirit, a cow also being dedicated to the spirit to placate it. Note on print reverse ms pencil - "64 2 A159" & print front border ms ink - "NUER XV/100"
Morton, Chris. 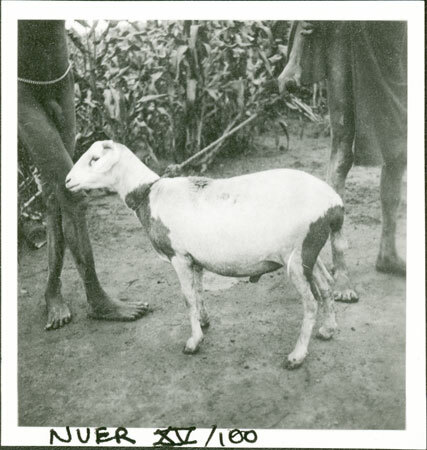 "Nuer sheep for sacrifice" Southern Sudan Project (in development). 03 Jan. 2006. Pitt Rivers Museum. <http://southernsudan.prm.ox.ac.uk/details/1998.355.750.2/>.